Today’s “Card of the Day” features 4n0783r l3375p34k! 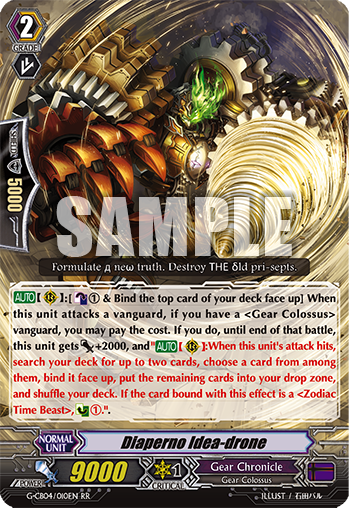 [AUTO](RC):[Counter-Blast 1 & Bind the top card of your deck face up] When this unit attacks a vanguard, if you have a <Gear Colossus> vanguard, you may pay the cost. If you do, until end of that battle, this unit gets [Power] +2000 and “[AUTO](RC):When this unit’s attack hits, search your deck for up to two cards, choose a card from among them, bind it face up, put the remaining cards into your drop zone, and shuffle your deck. If the card bound with this effect is a <Zodiac Time Beast>, [Counter-Charge 1]. A correction about Metapulsar, Altered Dragon. The first ability is NOT a required cost but an additional, optional way to pay the stride cost (basically turning your Zodiacs/Colossus in any Gear Chronicle deck into Stride Fodder for him).